Please kindly use the contact form to report difficulties, strange behaviors or persistent problems, and quote the program name or the number 5547 . 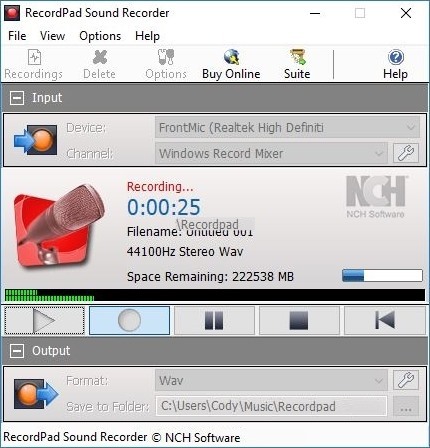 Download page for the app RecordPad Professional Edition - RecordPad Professional Sound Recording Software is a simple recording software for Windows. RecordPad Professional is ideal for recording audio for use in digital presentations and projects. The size of the installation is small and downloads quickly. You can use RecordPad Pro to record sound, voice, music or any other audio type. Recording audio on your computer has never been easier. Easily use the software to record audio notes, messages, announcements in wav or mp3 files.